Halfway through CTRF – Still two weekends to go! Not to jinx myself or anything, but the Connecticut Renaissance Faire has been going fabulously so far! We’re halfway through the run (you still have two weekends to come join in the fun! ), and have had two weekends of glorious, sunny weather, great crowds, and generally fun times. 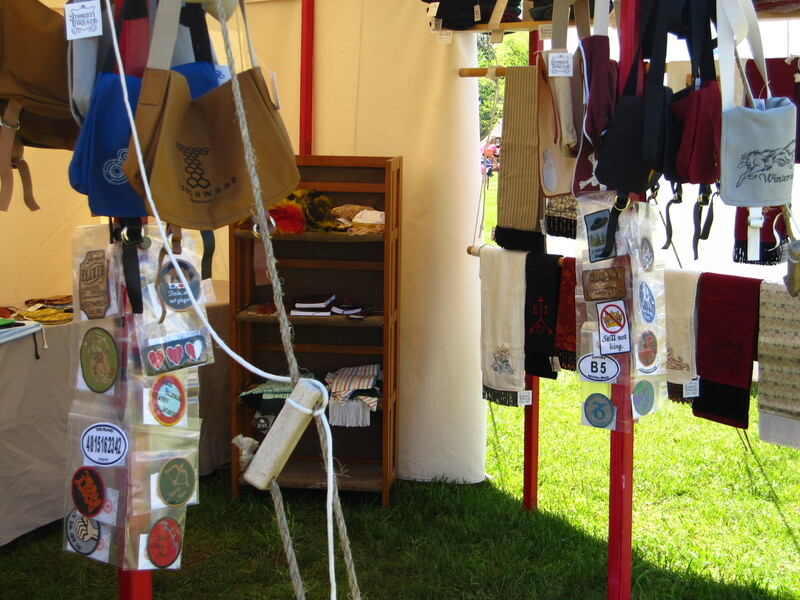 Bags and patches displayed at the front of the Storied Threads tent. This past weekend was CTRF’s Steampunk / Time Travelers’ weekend, and I have to say — Kate and I pretty much rocked the theme. Kate went all out with her Victorian jacket ensemble, and I decided there was no better time to wear my Whovian cincher skirt from Corsair’s Boutique. 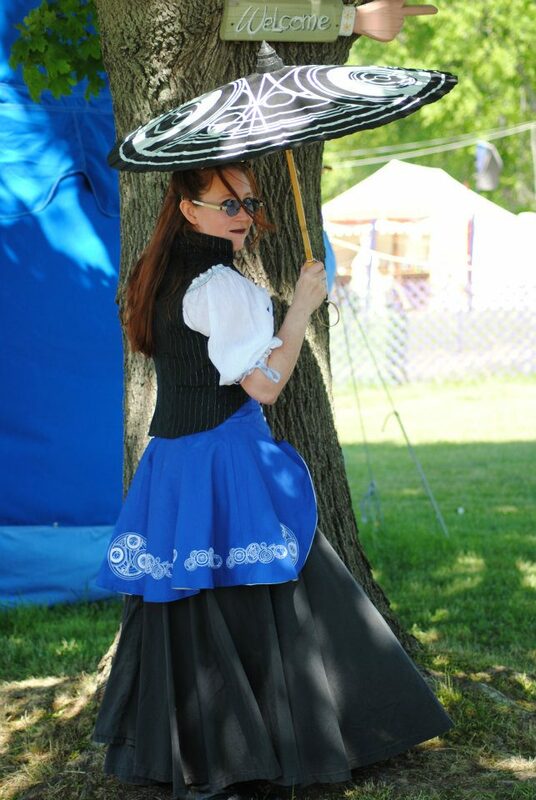 Which was perfectly complemented by my new Time Lord Seal parasol, custom painted by Laura at The Shady Emporium. This coming weekend is Romance Weekend at the faire, where Friar Tuck will be doing vow renewals. And the final weekend is Pet Weekend! My favorite of all theme weekends, as Beatrix can hang out in front of the tent where she can watch people go by, which makes her much happier than sitting forlornly behind the table. Plus, I get to say hello to everybody else’s pets, of course. I’ve been having a blast as this show so far, and hopefully it will end as well as it’s begun! This is just a gratuitous picture of my Whovian ensemble, taken by Lauren Dubois, because I feel like showing it off a little more. Not every design is a winner. A year ago, I started making patches in earnest, finding that not only did people like buying them, but I liked designing and making them as well. I like finding fun ways to commemorate a favorite moment from a movie, or character from a book or TV show, and I like that other geeks appreciate these things, too. The looks on people’s faces when they walk into my tent at a show, and GET all the jokes, just makes me happy. At this point, I make a LOT of new patch designs. I aim to have at least two or three new designs to list on Etsy every week, in an effort to keep my shop fresh and interesting, and to attract return business. As a result, my brain is constantly churning over pop culture references, both old favorites (Hitchhiker’s Guide to the Galaxy) and new obsessions (Avengers!). The thing is, though, in this many designs — there are bound to be a few duds. Things that work beautifully in my head, but don’t translate so well to real life. Or designs that take a few tries, and some tweaking, before hitting on the right version. 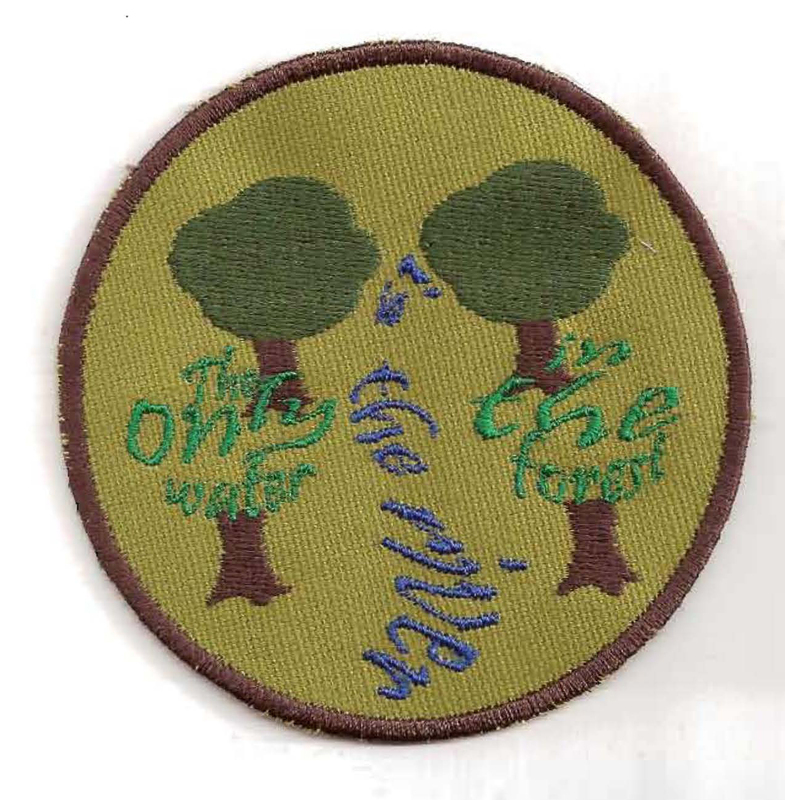 For instance, I’ve wanted for ages to do a patch for “The only water in the forest is the river”. But I’ve been having trouble visualizing it. I know the words, but I can’t figure out what image goes with them, or what sort of look it should have. A few weeks ago, I had what seemed like a brilliant idea — to take the words, and shape them INTO a forest and a river. I’ve seen other kinds of art where the words themselves form a shape, and it seemed like a concept that might work for this patch. So, I got myself some trees and rivers to use as templates for shape, and started manipulating away. Ran the test version out….and was deeply, deeply disappointed in the result. I mean, you can see where I was attempting to go with this. But…it just didn’t quite work. 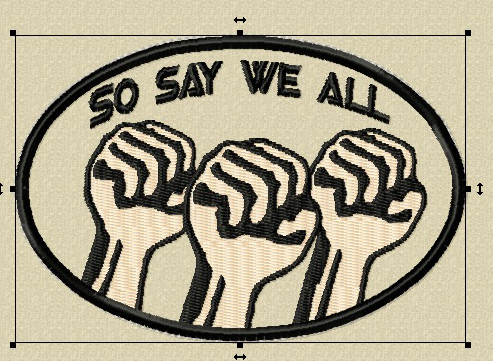 It’s a patch concept that, as a result, still vexes me, as I am back to square one with it. Other times, designs simply require more experimentation before they work. 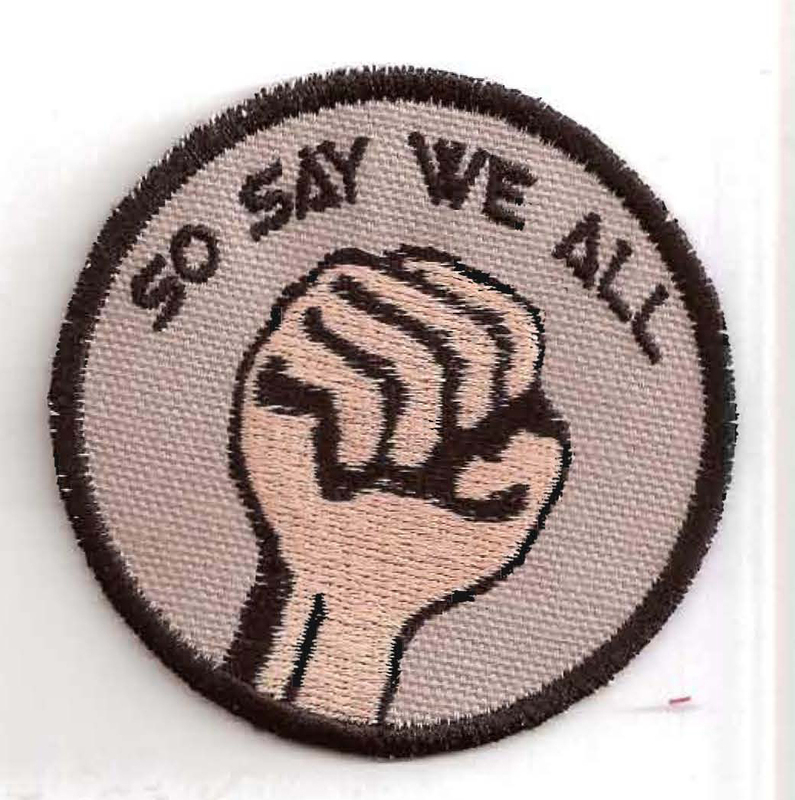 For my “So Say We All” patch, I set up two versions initially — an oval shape with multiple raised fists, and a 3.75″ version with only one fist. I sent computer simulations of both versions over to Mike for his opinion, and we eventually decided that the single fist version was simply cleaner and less cluttered-looking than the other. However, even that wasn’t the end of the adjusting on that one. When I ran it, it looked just…odd…as a 3.75″ diameter. Somehow, in that large size, it just didn’t work. I shrunk it down to a 3″ size, and finally had a patch I felt was good enough to sell. It’s a funny thing — some designs come together so quickly and easily it hardly feels like work at all. Others take multiple versions and test runs before I feel they’re good enough to bear the Storied Threads name. And occasionally, a design just so utterly fails that I have to shelve the whole thing, and let the idea percolate in my subconscious for a while until a completely new way of doing it occurs to me. Part of me cannot believe that the Connecticut Renaissance Faire opens this Saturday, just four days from now. Part of me is terrified that I won’t have enough stock. Or the right stock. Or a million other things. But most of me is just completely excited for it to finally be here! We went down to the site this past Sunday to set up the tent, and they’ve done a lot of work getting a new an improved layout in place. Last year there were unforseen issues when one of the roads completely flooded the first weekend, causing a lot of vendors and stages to have to uproot and move, and the result was a lot of traffic issues. This year, that low-lying area is simply not being used, and the faire has instead expanded back into higher ground that will hopefully handle inclement weather a bit better. They’ve moved stages around to make sure there’s a draw to every corner of the site, and arranged vendor tents to try to give clear sight lines everywhere you go. The nice thing about being there on Sunday is that, in addition to getting my tent set up (with a LOT of help from my friend Ben, who you will see playing the village barber/surgeon during the run), I got to see a lot of the dress rehearsal. I saw three of the scenes in their entirety, and bits and pieces of many others, and I have to say — you are going to LOVE this show! The actors have really meshed well together, and it’s clear that they’re having a lot of fun telling us this particular Robin Hood story. The fights are great, the script is fun — you really just have to come see it. Bert (Dustin Abbot), Will Scarlet (Elya Bottiger), and Little John (Johnbarry Green) at the CTRF dress rehearsal. In addition to the awesome scenes, of course, there will be tons of variety acts, such as the Vixens en Garde, Wolgumut, and more. And the shopping! Did I mention the shopping? It may have slipped my mind. In case you’re into that kind of thing, though, there’s even a whole coupon book ready for you to print out and bring with you! I protest, sir. I am not a merry man! 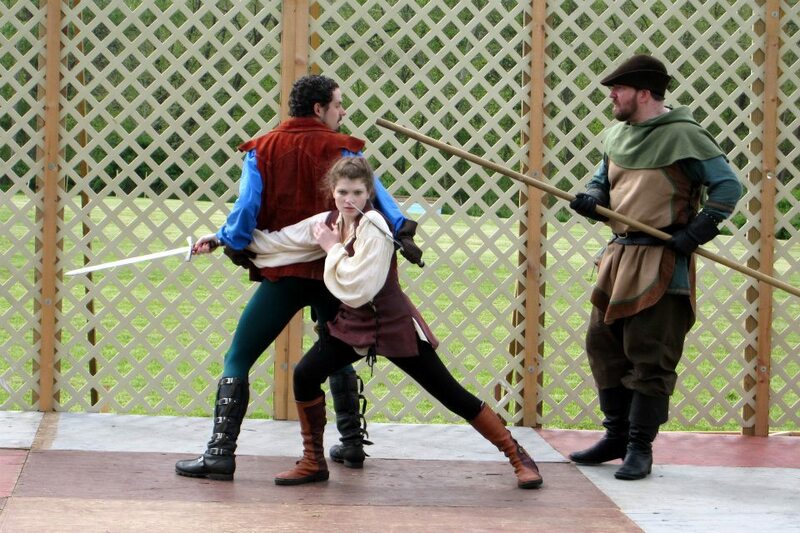 The Connecticut Renaissance Faire’s Robin Hood Springtime Festival is coming up fast, opening in only 11 days! Frankly, I can’t believe it’s this close. It always seems as though I have plenty of time to get everything done, until suddenly I wake up one morning and I realize it’s practically here. For this show, that moment came a few weeks ago, actually, when Mike started going to Connecticut every weekend for rehearsals. 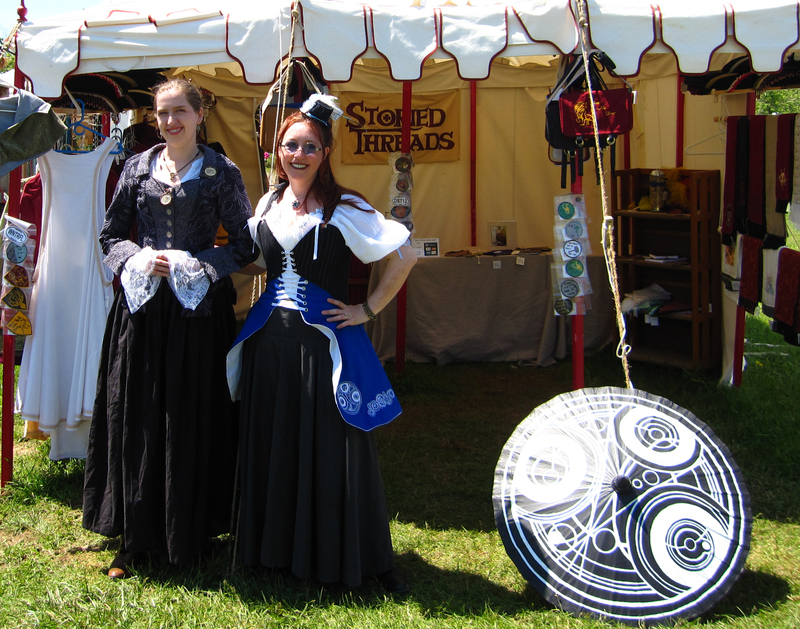 At last year’s Robin Hood show, I debuted my Doctor Who Awareness Ribbon patch. It seemed like a fun little thing to do, and I thought I’d sell a few. And that was the beginning of the patch mania that has taken over a good chunk of Storied Threads. 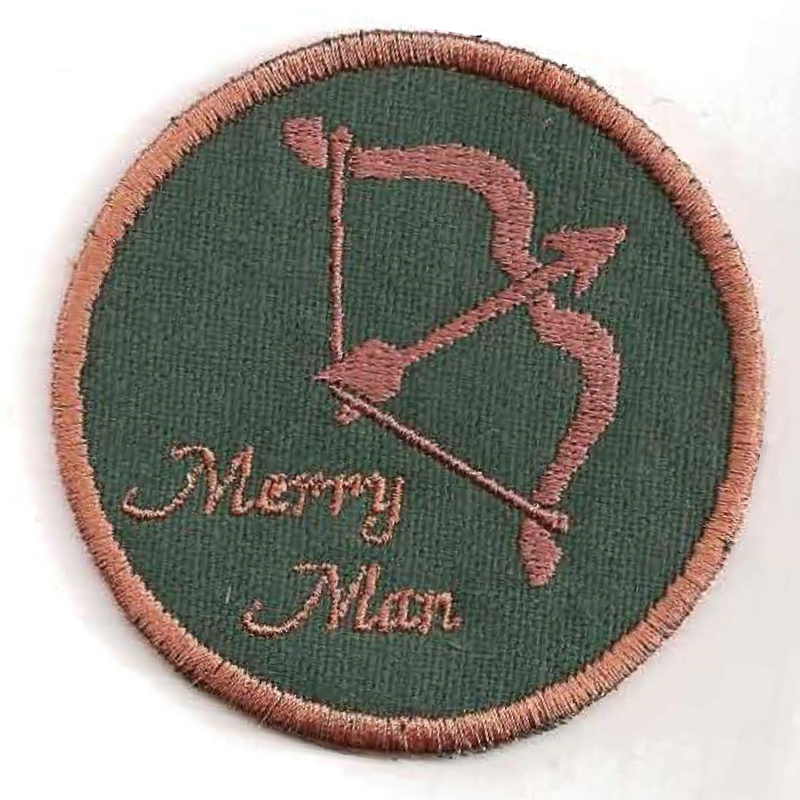 So, one year later, I’ve decided to design a patch especially to sell at this show — a Merry Man patch. It’s a simple enough design, but done in nice forest green and browns to match Robin Hood and his boys. I’m hoping they’ll be a fun souvenir, not just for my regular customers, but also for kids who join up with the Merry Men over the course of the day and want to show their allegiance off in defiance of Prince John and the Sheriff. But then, there’s the geek in me. And once this patch was done, I realized that a Bat’leth curves in a very similar way to a bow, and I couldn’t help but think of the episode of Star Trek: The Next Generation when Q puts Picard and his men into a Robin Hood scenario, casting Worf in the roll of Will Scarlet. And Worf exclaims, “I protest, sir. 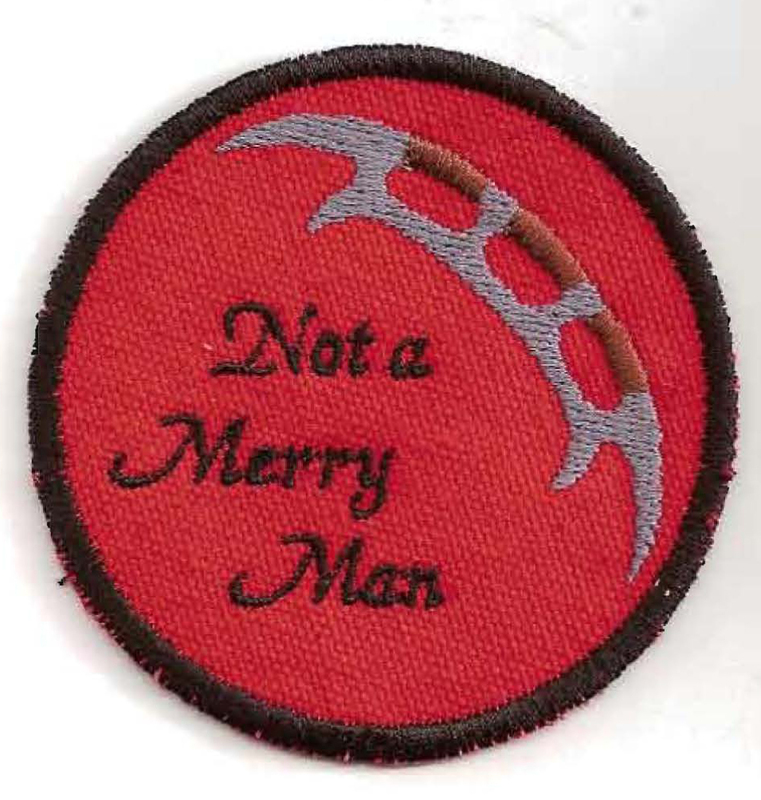 I am not a merry man!” And so….I had to make THAT patch, too. For those of you who are not merry men. Or who just love you some Michael Dorn. Over the course of the next 11 days, I’ll be making as many as I can of both of these patches, fitting them in and around my Etsy and custom patch orders. So, stop by the Storied Threads tent and check them out — but if you want one, try to stop early. Once they’re gone, I likely won’t have time to make more until after the show!